Making your music sound much better - the flagship PURITY range of cables from Keith Louis Eichmann. Just 18 months ago we did a comprehensive review of what was the best analogue interconnect cable we'd heard - the KLEI gZero20. The conclusion we came to still bears repeating - Not only are they highly likely to be the greatest improvement you’ll make for the amount spent but you’ll also gain more from all the other parts of your system - we’ve gained a new appreciation of the fidelity possible from our turntable, amplifier and speakers and are actually happier with them and now less likely to make component changes than we would have been otherwise. They improved on every aspect of performance and often in a substantial way. That it has been possible to better this standard with not just one, but a range of 3 new Interconnects, an AC power cable and a speaker cable, is quite remarkable. Keith Eichmann is a uniquely talented designer and while we would have been perfectly happy to have continued with the gZero20 for several years, the performance of these new cables needs to be heard. The new PURITY range has its genesis in the original gZero series. There was a brief intermediate, the gFlow cables which was effectively the proving ground for most of the ideas which are now presented in their ultimately refined form as PURITY - an apt description if ever there were one for a both the cable and the sound. The AC power cable is both the newest model within the range and also the most affordable. For may systems this would be where I'd suggest you start, as while it might not have been your intention to look at a power cable, my own listening experience suggests that the improvements made by this cable are of a scale that is at the very least equal to the signal cables and it sets the stage for further improvements by allowing your amplifier to perform at a significantly higher levels. Like the gZero series, the 3 models are differentiated by both the plugs and internals. 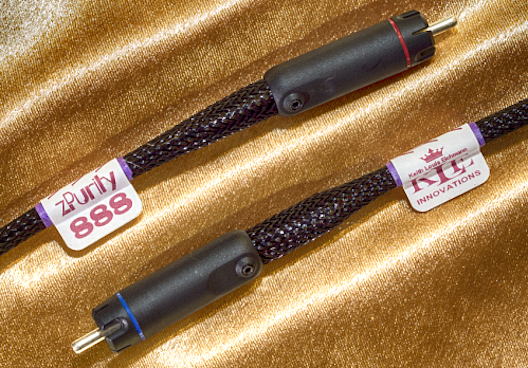 The Purity 8 IC uses the Pure Harmony plug, the 88 is terminated with the Absolute Harmony and the penultimate Purity 888 has the exclusive Perfect Harmony plug which is not available on any other cable. What we do know about the different versions of the Harmony plugs is that the performance is dictated by the metallurgy of the two conducting elements - the central positive terminal which is hollow and the single negative pin located in the collar. By moving from high purity copper, to a combination of this and silver, then silver throughout and finally (I suspect) an ultra pure silver, there are tangible improvements in sound quality. This in part, is responsible for the increasing levels of resolution between the 3 Purity cables. I also think that it's safe assumption that the KLEI Purity cables incorporate silver in some or all conductors. Keith isn't giving too much away, but as someone who has always been enthusiastic about the sonic properties of silver in cables, I'm sure I can hear this coming through. Kimber produced the first silver interconnect I heard - the KCAG is still in production and it is abundantly clear that it outperforms both the copper and copper/silver hybrid versions of Kimber cable that share the same configuration. SlinkyLinks took this equation further, but produced interconnects that were designed exclusively to have silver as a conductor - their air-dilectric simply would not have worked with copper. They also were one of the first adopters of Keith's original Bullet Plugs and then the even better Silver Bullet. Kimber also improved upon the KCAG - first with better quality RCAs from WBT, but then with the Select range which had a much more sophisticated cable architecture employing original ideas in conductor profiles, dielectric, damping and braiding. Within the Select range, the copper cable outperformed the KCAG, validating the more complex construction But as we progressed up the range, the conductor materials changed from copper, to a mix of copper and silver, then ultimately all silver. So you can see that there has been a real progression in interconnect cable design and that at least 3 parts to this have a really significant impact on improving performance - the plugs used, the configuration of the cable and the materials used in both conductor and insulator. Even this is quite a simplistic view of what goes in to the best cables and if it were this easy then everyone would be marketing top flight cables. Keith Eichmann 'gets' silver. The first Silver Bullet plug was ample proof of this and I believe that this understanding is allowing him to really produce something quite astonishing with the Purity cables. Keith cables are also effectively unique in that he starts with his own original connectors and builds the cable as an entire and complete system. While the Purity interconnects could never be described as cheap, the asking price is by no means high in terms of what cables can and do sell for - this is easy enough to research. But what I will contend is that these cables may well represent some of the very best value in the world of audio. We do know that the entry level gZero1 IC sells for less than one tenth of the Purity 888 yet is outwardly similar - so Keith isn't doing his pricing on the basis of appearance or hype. I know him well enough to understand that the cost difference is directly attributable to the material input into each cable and that if he were able to produce the same level of performance for less, he would. In fact the comparison between the original flagship model - the gZero20 IC and the new Purity 8 IC demonstrates this. I've had serious listing time with both and my conclusion is that the Purity 8 is better and happily sells for NZ$500 less. So let's get down to the nitty gritty of what you'll hear. The Purity 8 IC is all about resolution - from the moment you first connect these cables, you'll be hearing far more musical detail. Like all KLEI cables there is a definite settling in time and a real burn in period. Because the resolution is greater than with the gZero series, these two effects are both more obvious and more extended. This isn't to say the cables don't sound great from the outset, but over a period of days then weeks, it becomes appreciably better. The music flows in a more organic way, notes carry and sustain in time and space. We noticed that music fills rooms and sounds markedly better over a distance. It really only takes a few days to form a conclusion on where the Purity 8 IC sits relative to the gZero20 - the Purity design is a lighter touch, more subtle but also more open and detailed with better sound staging precision, a background that is more airy, allowing more to emerge. Sweetness and light. It's hard to be critical of the gZero20 given my initial experience and enthusiasm but I have to admit that Keith has found ways to improve upon it. The Purity 88 IC is the next level up, and with price parity to the original gZero20, I can say that this cable improves upon it in every parameter - we step up to the Absolute Harmony plug and it's obvious that there is more going on inside the cable. The best analogy is that this is like going from an entry level amplifier to a serious pre/power combination - scale, depth, and solidity are all enhanced. If this were the top of the KLEI cable range I'd be perfectly happy. I suspect Keith has thrown everything he can at the Purity 888 IC - a one-off plug that appears on no other cable and while we can only guess, the innards are likely to be both more complex again and conductors even more esoteric. I'm going to avoid any flowery descriptions here - quite simply if you want the very best performance from your system, this is the way to get it. Are there better cables out there? I have no idea - there certainly are more costly ones but the designers have shown no inclination to seek us out and let the sonic performance of their cables prove their superiority. The new KLEI cables I have been able to listen to at length, going right through the range. At each step there has been a palpable and worthwhile improvement in sound, building on the previous benchmark in a logical and persuasive manner. The conclusion I reached with the gZero20 that these cables are components in their own right applies directly to the new KLEI Purity IC range - We can draw a direct comparison to the NuPrime range of electronics which cover similar range in terms of price territory and to my mind, offer a fresh take on both performance and value. Each of the Purity IC versions offers a performance gain that it directly analogous to what we hear when stepping through the NuPrime model range. You should also be aware that all of my descriptions of what the KLEI cables do are in the context of real world affordable systems - in our own system at home, some of the components cost less than the cables and might could be regarded as not much more than entry level - yet to Carolyn and myself, every improvement was obvious and worthwhile. We simply play the music we like, usually from our turntable and more recently we've really taken a shine to the new little Questyle QP1-R player.Purity range is by no means aimed at the wildly esoteric end of the market. Although I strongly suspect it's going to be making some real waves in that sector shortly. The Purity speaker cables just rock for want of a better description. Unlike the interconnects, there is only one version and the question really will be 'how long?' With conventional speaker cable on a roll and at relatively low cost, this wasn't really so much of an issue. The KLEI Purity 8SCs are effectively a bespoke item and the material cost makes it prudent to look at how you might be able to arrange your system in order to keep the distance between amp and speakers both no longer than it needs to be, and effectively symmetrical. For the better part of a decade, my own preference for speaker cables were the NZ made pure silver SlinkyLinks. I'll admit that having these (as do a great proportion of our clients) meant that our uptake on the KLEI gZero speaker cables has been hesitant. The Zero2 SCs were different from, but effectively on par with the SlinkyLinks and at similar pricing. Recently I came to the conclusion that the gZero6SC did outperform our own custom made set although there were a lot of areas where they were quite similar. So the reason to change was nowhere near as compelling as it was with the interconnects which now populate our home system. But the Purity 8 SC have completely altered this dynamic. The Purity 8 speaker cables deliver a huge jump in performance. From top to bottom there is dramatically better speed, impact and scale. While delivering copies amounts ion detail and really allowing high notes to soar, there isn't a hint of sibilance or compression. Bass is absolutely rock solid and an order of magnitude better than any other cable I have listened to. In a system with amplifier and speakers in reasonable proximity, the KLEI Purity 8 SCs are likely to be the most significant and cost effective upgrade you can make. Given a 2m stereo cable set is exactly the same cost as a pair of the 1m Purity 8 ICs, you'll start to see the logic in this. It may well be that if you have one of the new generation of digital amplifiers such as the NuPrime IDA-8 or IDA-16, there are no other connections required and in this context you'll get brilliant value for money. The Purity SCs are the complete antithesis of most high end speaker cables - relatively thin, discrete and pliant, the KLEI cables contrast with firehose like offerings or overly complex and heavily terminated bi-wire sets that can often cost more and most certainly do not perform as well. We learnt a long time ago that cable diameter is no guide to quality and while we're the first to suggest that termination is an inherent part of a cable's character, the idea that plugs have to be heavyweight gold plated feats of engineering has been clearly demonstrated to be counterproductive. The KLEI speaker cables all feature the same prosaic little 4mm instrument plug that originally graced the Slinkylinks cables - this 'less is more' approach appeals to me as it presents far less of a barrier to music. You'll also appreciate that with the better cables, you're paying for the cable and performance, not the bling on the end. While I won't be surprised if Keith comes up with a superior termination like his Bayonet Plugs in the future, we do know that it will be a simple task to change over to these at that stage. When ordering the Purity cables would normally have a lead time of around 3 weeks due to both the complexity of manufacture and Keith's stipulation that any cable shipped has been prepared by a controlled burn in process (cooking). because of this I've taken to carrying some samples of both the Purity 8 ICs and speaker cables in stock that that will allow you to try these cables yourself assuming you'd still like to be convinced. While there will still be a relatively short settling in period, this is not as profound as a full run in which may extend over months of normal listening, so you'll get a good idea of what is possible. But ultimately your own new set that you can take from new to fully run in will be the most fulfilling option. Of course, you can't look at theses cables in isolation - they will only work as part of a system and so how great an improvement you get is also dependant on the resolving power of other components. I don't think that there is however a direct correlation between any given components performance and its price - some quite modestly priced components can literally come alive when the connections allow their performance to be properly heard for the first time. With many systems there will be a number of connections to be made and you will probably be asking what is the most cost effective approach. I think of the KLEI Purity range the icing on the proverbial cake, to be purchased once you are satisfied with everything else in your system. As we've suggested above, you don't have to go to particularly expensive components to appreciate what the KLEI cables can do. 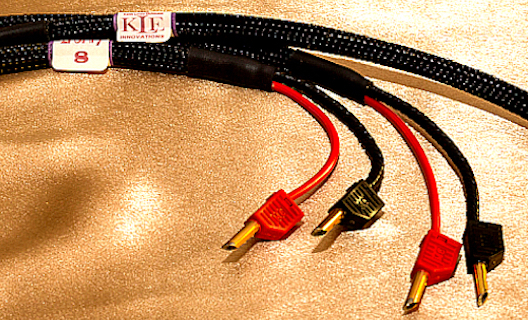 Before you consider purchase of audition of the Purity models, I do recommend you try the KLEI mains cables - many of our clients are finding that these make and unexpectedly dramatic improvement, well out of proportion to price and by allowing your existing components to perform at a higher level, you'll set the age for getting the most out of the interconnects and speaker cables. Every system is different, but we do know that every bit of music is going to travel through the cable between amp and speakers. Given a two metre pair of terminated Purity 8 SCs come in at the same price as the Purity 8 ICs - NZ$2000 - if you are looking at a short run, this is where I'd start. Longer cables may change this equation but we're happy to go through all the options with you. When looking at interconnects, ask yourself how many sources of music you have and prioritise on the basis of what you'll get the most use (and hence benefit) from. If you have a seperate pre and power amplifier system, the link between them is the obvious place to start. In better analogue systems the KLEI Purity cables will shine. These days I have no particular bias as to which is the best system when looking at analogue and digital but it's the qualities of the Purity cables that seem most in line the best attributes we assign to analogue - the natural and organic flow of music. Analogue systems can also be both more costly and have more connections, so there is far greater scope to both improve things but also to look at the various options. Again, the Purity cables are no more in cost than a middling Dynavector MC cartridge and no-one is going to dispute the value of these. Given these cables will last a lot longer and also allow the sound of such a cartridge to be fully revealed, the logic of ownership is getting a lot easier to deal with. On the digital front, the warmth and analogue qualities of these cables seem to deal with any reservations I've had in the past about the performance of the better breeds of DAC and disc players - the performance of these as advanced greatly - the rate of development of the Oppo and Cambridge players as an example with effectively 4 generations in not many more years, each markedly better than the previous. With DACs, we can get performance from an entry level product that would have astonished us in a unit that cost ten times more not that long ago. So not only are the demands on cables greater, but the improvement you'll get are much mores than was possible last time you looked. NZ/AU plugged. Contact us for other lengths. John Ransley and Carolyn Guytonbeck are the principals behind Totally Wired. It’s our own business and we take pride in building something worthwhile.